In the 1970s oil came to Shetland. 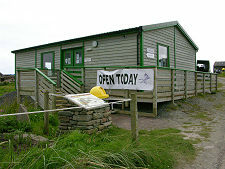 Sumburgh Airport expanded to accommodate increased air traffic, and the developments included a new access road to the control tower. No-one expected that the mound, through which the road had to pass, was not a natural rise but an Iron Age village. 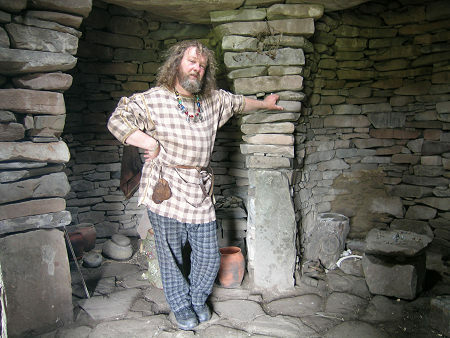 The then curator of the Shetland Museum confirmed that the workmen had discovered a new broch. 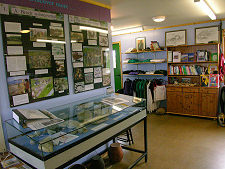 Twenty years later, Shetland Amenity Trust bought the ground, raised the funding and invited the University of Bradford to excavate the site as part of a public heritage project. No-one anticipated just how spectacular and extensive the results would be. The multiperiod site represents over 2 millenia of continuous occupation. 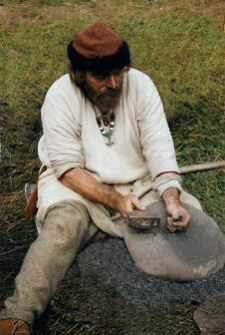 The earliest evidence takes the form of cultivated soils containing Late Bronze Age/Early Iron Age pottery, and midden deposits which predate the construction of the Iron Age broch, defensive ditch and later settlement. The site is now being consolidated in order to keep it safe for the future. 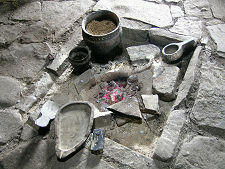 The process is recorded in detail in the same way the excavation was done. Today visitors are shown round the site by costumed guides, safe in the knowledge that they are not damaging any of the 2500 year old structures. Eleven summer of excavation revealed several phases within the site. The broch is the oldest building visible: although it is likely people were living at Old Scatness before the broch, none of their buildings have been uncovered in order to preserve the Iron Age ones. The broch was built between BC400200 (the middle of the Iron Age) and it is a massive structure with walls almost 4m thick. The staircase which would have given access to upper floors is clearly visible. 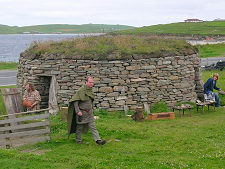 There are later structures built inside the broch. There is also a huge defensive ditch surrounding the broch. It was approximately 45m deep and 7m wide. 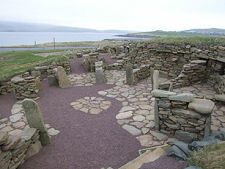 The village which grew up around the broch was occupied by Iron Age, Pictish people, and Vikings. There are no longhouses visible on the site; perhaps most have been removed by later activity. 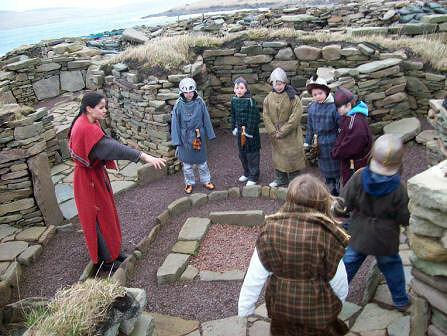 However, some of the Pictish houses were re-used by the Vikings: lots of soapstone artefacts were discovered which were considered to be Viking in origin. Older disused houses were built on top of by later generations of people. There is evidence for later post-medieval and crofting activity including a 17th century corn-drier, coins and the remains of a croft house and outbuildings, both of which were removed by the end of the 19th century. 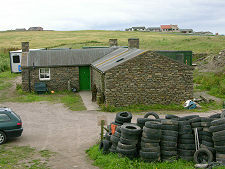 The croft house to the southeast of the site was restored by Shetland Amenity Trust in 1994 as a camping bod. One reason why this house was selected for restoration was because of the it had been the home of Betty Mouat. In 1886 she set out on her first visit for 14 years to Lerwick to sell knitted shawls she and her neighbours had made. Roads in 1886 were not what they are today, so Betty travelled on a 50 foot sailing boat, the Columbine. Unfortunately the skipper fell overboard en route, and the crew, who jumped in to save him, then lost contact with the boat. For eight days Betty Mouat lived on some ships biscuits and a bottle of milk, before the boat ran aground on the coast of Norway. Betty returned home a minor celebrity and was even sent a letter by Queen Victoria. 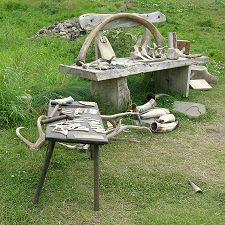 During the summer months Old Scatness Visitor Centre is open and you can take a guided tour, see the Living History craftspeople at work, and have an opportunity to experience what life was like in the replica Iron Age and Pictish buildings. 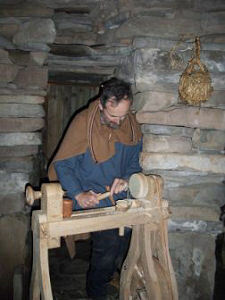 You can also dress as a Pict or a Viking, sit by the fire, play Kubb or perhaps try your hand at the days' activities. The shop sells gifts inspired by some of the finds from the site, and many local craftspeople supply exclusive merchandise. Old Scatness Broch Web Page.